BYU research shows that Utahns are not alone. John Denver sang, “rocky mou’un high”; Diana Ross and the Temptations sang, “ain’t no mou’un high enough.” All across the country, Americans drop t’s to the back of their throats (called a glottal stop)—but Utahns, with their “Wasatch Mou’uns,” seem to get the most grief for it. BYU linguistics professor David S. Eddington (BA ’86) recently published studies on Utah’s glottal stop in words like mountain (mou’un) and kitten (ki’un) in American Speech. “It’s not the t-dropping that’s interesting,” Eddington says of the Utah dialect. “What’s interesting is what happens after that sound.” Utahns release the vowel after the t through their mouths instead of their noses. But they’re not alone. Linguists have noted the same oral vowel release in California, New Jersey, and elsewhere. Is Utah English really all that different? 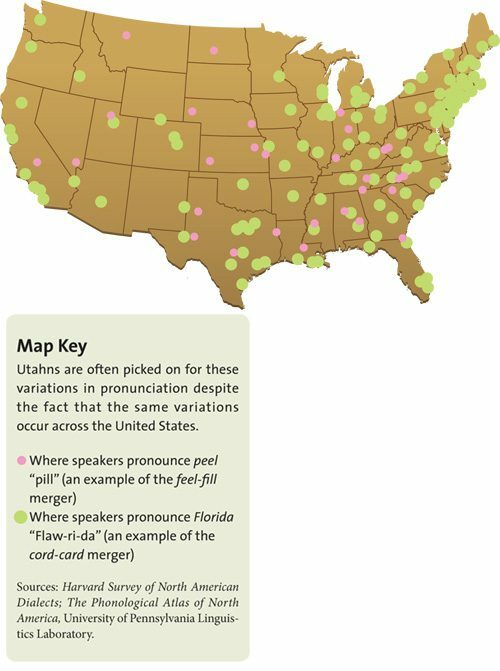 BYU linguistics professors David S. Eddington (BA ’86) and Wendy Baker Smemoe (BA ’91) offer their take on Utah dialect stereotypes. Warsh for Wash: typical of rural American English; found in Utah but not prevalent. Skull for School: typical of younger Utah speakers, but originated in Southern California. Thank you, surfers. Melk for Milk: typical of Utah dialect; it’s uncommon in Standard American English to relax a vowel before l. Gotcha, Utahns. Mondee for Monday: feature of older Utahns’ speech, but also typical of southern American English. Hembook for Hymnbook: similar to the pin-pen merger in southern American English. What are the most powerful passages of all time? Humanities professors pick their favorites for permanent display. Disney, Netflix, and Chief Justice John Roberts are paying attention to the work of one word-mining professor.